Morocco offers a superb mix of great culture, wondrous architecture, beautiful beaches, stunning scenery & amazing weather with plenty to keep every member of the family happy. With a flight time of just over 3 hours from most UK airports, Morocco is within easy reach, and with average temperatures around 29°C, there’s no reason not to try this underrated destination. There is so much to do in Morocco that no two holidays are the same. Many of the beaches here offer a wide variety of watersports, perfect for any adrenaline seekers. For those looking for something even more adventurous, take advantage of a 4x4 adventure tour and prepare to lose yourself in the rich diversity of Morocco. Another highlight of a trip to Morocco is the delicious cuisine that is unlike anything you will have tasted before. Subtle spices and intriguing flavours are common occurrences in many of these dishes with B’ssara, Makouda and Couscous being just a few of the most popular dishes here. With an array of exciting and refreshing resorts, Morocco is the perfect place to visit for a family holiday. Here are some top reasons to encourage your site visitors to book a holiday to Morocco..
Moroccan cuisine is well known for its exotic flavours. Popular dishes include zaalouk (a smoky aubergine puree), harira (a lamb broth) and Morocco’s national dish tagine. Marrakech is the perfect combination of old and new, offering a mix of trendy bars and restaurants, peaceful retreats and breathtaking scenery. Entertainers’ line the streets as you make your way around the resort so expect to see everything from snake charmers to acrobats and much more. Located on the shore of the Atlantic Ocean at the foot of the famous Atlas Mountains, Agadir is a modern and bustling resort offering an array of activities such as watersports and trekking alongside fantastic restaurants and marvellous beaches. If you're looking for somewhere with over 300 days of sunshine a year and fine sandy beaches to enjoy a truly relaxing break, a holiday in Agadir is just the answer! With a big sweeping beach and relaxed attitude, Agadir is Morocco’s premier package holiday destination. Its resort area was completely rebuilt in the 1960s following an earthquake and, while it looks a bit dated now, it still ticks all the package boxes. Plus it’s cheap – the price of an all-inclusive holiday has dropped by 13% on TravelSupermarket compared to last year. Like Bulgaria and Turkey, Morocco is outside the eurozone and the cost of living is very cheap, meaning souvenirs should be a snip. It also gets 300 days of sunshine a year but the Atlantic sea breeze keeps the temperature on the enjoyable side. This hotel combines the fun and excitement of an aqua park with the beauty and tranquillity of lush gardens with olive and palm trees. 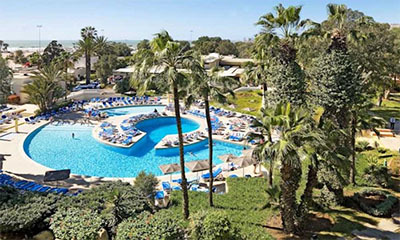 This hotel offers a great base to explore the rich history and culture of the city with its charming souks, bazaars and colourful characters..
Set on Agadir’s Bay, a few steps from the city centre, this complex offers a club style atmosphere which will be appreciated by families and younger couples. Situated in close proximity to bars and nightlife and all the resort amenities.